Blogging has emerged as one of the most effective digital marketing tools over the course of time. According to a study by Hinge Marketing, blogging is the second most effective digital marketing technique after. The growing influence of blogging has paved way for many bloggers to use it as a tool to promote their business. Bloggers have to feed their audience on daily basis. They have to serve them with the right information so that they continue to read their blogs. Since you are competing with a phenomenal number of bloggers, you have to set a right frequency of posts to be able to compete with other bloggers. 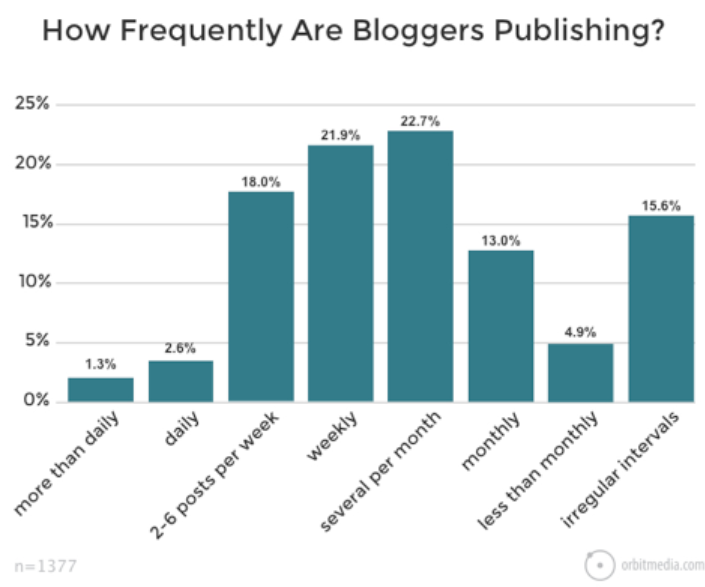 As you can see in this graph by Orbit Media, there are 21.9% of bloggers who publish blogs on weekly basis, while there are 2.6% of bloggers who publish blogs on daily basis. Depending on your blogging goals, you need to set a frequency of your posts that can match with the competitors within your industry. You need to publish articles consistently so that readers keep coming to your blog and read your articles. We live in a world that is driven by social media. The growing influence of hashtag and trending topics has changed the rule of blogging and people focus more on topics that are creating more noises on social media. In the past, we have seen the phenomenal popularity of hashtags like “metoo”, “brexit” and “blacklivesmatter”. So you can also cash in the noise that is created by these popular topics. Use tools like “Google Trends” to help you find the hot topics within your industry whether you belong to digital marketing agency or run assignment writing services UK. Design is another important aspect of a good blog. To make your blog stand out from the rest, it should have the right graphic elements that give it an individual appearance. You need to make sure that your blog looks appealing to the eyes and have the right colours that suit the taste of your audience. Having an appealing design of your will make your blog stand out and you will be able to beat your competitors. Writing on topics that are too common doesn’t help you catch the attention of your target audience. To make your blog stand out, you need to write on unique topics that have not been addressed. You need to bring to light the existing issues in your industry or predict future trends. All these things would make good topics for your blog. Let’s say you are a digital marketing agency, so you can write an article on the future digital marketing trends. Similarly, if you are a cloud service provider then you can address the current loopholes in the cloud services as well as offer the solutions. To make your blog stand out, you need to give it a certain personality. You need to set a unique tone and styling of your articles. It has to bring out a unique element that makes people relate to your blog in a certain way. You need to include in your blog all those elements that can create a unified voice of your blog. Influencer marketing is getting bigger and better with time. With influencers, you can take your blog in front of your readers in a quicker way. Based on a survey by Statista, 58% brand strategists believe that influencer marketing will be part of their entire marketing activities, while 27% of marketers believe that influencer marketing is going to become a catalyst for digital transformation in the next 3 years. Such is the power of influencer marketing. So if you can integrate the influencer marketing into your marketing activities, you will be able to create many strong voices to endorse your blog and this will give you an edge over your competitors. Ebooks are written by bloggers and writers to lend authority to their expertise. Similarly, you can write ebooks to establish yourself an expert within your niche so that more people join your blog. You can pick the popular topics and themes that your audience would like to read and make it available on your blog for free. In this way, you will not only reinforce your authority as a blogger but also increase the visibility of your blog. Social media is a powerful platform that can help you easily connect with your audience. A study by Statista reveals that 90% of businesses used social media to market their products in 2017 and the figure is going to reach 91% by 2019. The phenomenal popularity of social media has made it an effective source of marketing for every blogger who can tap into a large audience that number in millions. If you can make a strong presence on social media websites, you can significantly increase your outreach in the world which will definitely help you win over the competition.